3. and now this New Moon and Solar Eclipse at 18° Leo, on Saturday 11th August at 2.58am (PDT), 5.58am (EDT) and 7.58pm (AEST). I resonated with the sense of being ‘pushed’ into clarity by life and certain situations, compelled to act on my truth regardless of how unpalatable it was to others, as well as able to see things in a new light. What’s been arising for you over this potent time? What truths have called for expression? How have you been ‘pushed’ forwards in life (or not)? For the last month, we’ve been embodying this conversation between Leo and Aquarius, playing out in these two most recent eclipses. Anyone with planets or bodies in these signs may have felt like the volume turned up even louder! Leo and Aquarius lie opposite each other on the celestial belt that encircles our planet. These two constellations are opposites, and therefore kin. Aquarius is concerned with culture and community, and the ways in which the groups we are part of can embrace our unique (non-mainstream) instincts, questions and ideas, or not. Is there room for us to be different, and yet still welcomed? Leo is concerned with expression and self, and the ways in which the groups we are part of can witness and celebrate us in the fullness of our gifts, or not. Is there room for us to shine, and yet still be welcomed? Such kindred questions of belonging and acceptance, inherently linked to the experience of connection and community. Given we were moving to Canada, I put off buying (most of the) books that crossed my path in the first half of this year, attempting to be practical in light of my baggage allowance. And therefore, it has been a delight, upon arriving here, to stock up on a number of them – my list was rather long! 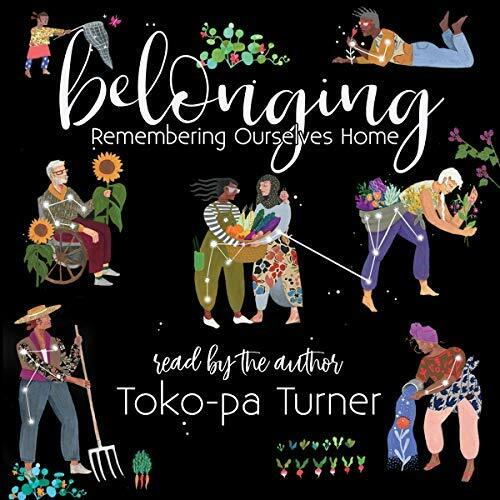 It’s no coincidence I picked up Belonging, by Toko-Pa Turner, in the middle of this Leo-Aquarius eclipse conversation, as I and my family settle into a new place. This book speaks directly, and with such precise insight and lyrical compassion, to the concerns and conundrums of self and community, oneself in community. What books or sources of insight have you felt drawn to, during this eclipse time? What new ideas have enlivened you? Wow, that’s a laser-beam, pointy eclipse question right there! An awareness-raising spark that illuminated a whole bunch of past experiences. What arose felt somehow surprising to me: I am ashamed of my self-doubt. This self-doubt feels so real, fully ‘evidenced’ within me. I’m not old enough, wise enough, extroverted enough, experienced enough, etc, etc. Clearly, not enough! I guess that’s impostor syndrome, right there. And this is all part of that Leo/Aquarius conversation: Leo rarely doubts herself, she knows she can shine; Aquarius often doubts herself, she knows the true power lies in the group, that the whole is greater than the sum of its parts. Now, that word, ‘aggrandising’ made me feel uncomfortable right away – I’ve spent a lifetime, as the Aquarius Sun that I am, attempting to avoid any such Leonine behavior, anything that could be deemed as obviously egotistical and self-promoting. Heaven forbid people see me as an attention-seeker! Heaven forbid I post too many selfies and come across as self-consumed! Heaven forbid I’m so busy with myself, I become oblivious to the stories of others! What am I ashamed of? What of myself have I rejected? So not only am I ashamed of my self-doubt, I am ashamed of my desire and need to be seen. I looked up the meaning of aggrandising, just to be ultra-clear (and yes, I missed my favourite fat dictionary, which didn’t [yet] make it into my suitcase – I hate relying on Google for such things!). Therefore, if what Toko-Pa says is true, then I can experiment with turning my internal voices on their heads! My community needs my playful, awkward, shiny Self, to inspire them to live with joyful reverence and deep delight, powerful antidotes for #mainstreambrainwashing. It’ll take me a while to live Toko-pa’s invitation with ease, but for now at least, I can hold these new possibilities and questions, and allow them to shape who I become. How is your community hungry for and depending upon your rejected qualities? At the eclipse Full Moon, two weeks ago, I wake from a dream in which I am part of The School of the Widely Open Heart. That was it’s name! I felt very blessed by my subconscious self, to be handed such a hopeful idea. I am at once deeply drawn to this symbol, a place of such learning! I know I am part of this school already, in my life in general, and in my work with The School of Shamanic Womancraft. But I am also scared of how much is required, how I am guaranteed to fail in openness-of-heart, over and over again. Self-belief and self-doubt, hand in hand… and regardless of this wrestle, I walk the path. This wrestle IS the path! I was not called because I am perfect, or know enough. I heard the call, it is as simple as that. And I am strong enough to take the next step. And so, if the opportunity of a New Moon is to call in that which we feel to be true and good and beautiful, to call in our Soul’s next unfolding, then what seeds will we plant this month, borne from the laserbeam intensity and insights flowing in from the last cycle? It’s a New Moon in Leo, time to shine, for the good of all our relations, truly the medicine of Leo and Aquarius, the medicine of self and community. For the rebels and the misfits, the black sheep and the outsiders. For the refugees, the orphans, the scapegoats, and the weirdos. For the uprooted, the abandoned, the shunned and invisible ones. May you recognize with increasing vividness that you know what you know. May you give up your allegiances to self-doubt, meekness, and hesitation. May you be willing to be unlikeable, and in the process be utterly loved. May you be impervious to the wrongful projections of others, and may you deliver your disagreements with precision and grace. May you see, with the consummate clarity of nature moving through you, that your voice is not only necessary, but desperately needed to sing us out of this muddle. May you feel shored up, supported, entwined, and reassured as you offer yourself and your gifts to the world. May you know for certain that even as you stand by yourself, you are not alone.